It’s no lie that high school plays a huge role in anyone’s future. It’s during high school that students begin figuring out who they are and what they want to do with their lives. Because high school is the first stepping stone to choosing a lifelong path, it’s important to take care of a few things before graduating. Do you want to go to college? Go straight into the workforce? Take a year off to figure it out? Decide on a goal and start working towards it. This isn’t easy for everyone, and if you find yourself getting stuck, think about your hobbies, skills, and things you’re passionate about. Figuring out what your goal is will help decide what your next step should be. If you are planning on going to college, it’s important to start researching schools early on. The sooner the better! Doing this allows you to decide which schools you’re most interested in, which will save you a lot of stress as graduation gets closer. While you’re doing your research. think about what they have to offer you, and how going to that school will benefit you in the long run. Financial aid is extremely important when it comes to college. If your family can’t afford to send you to a school of your choice, it’s a good idea to have a backup plan. There are several sites that help you find grants, loans and other forms of aid. Filing the FAFSA is a great place to start when looking for need-based aid. 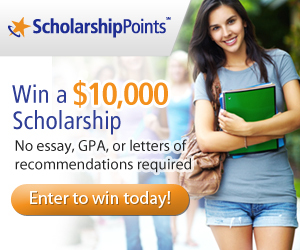 You can also supplement your essay-based scholarship applications with sites like ScholarshipPoints, where you can enter scholarships sweepstakes with points earned completing simple activities and surveys. It’s never too early to start looking for scholarships, so get on it! Every high school student should go on a college tour at some point. Tours are important because they help you understand what your college experience will be like, and what to expect from life on campus. Some high schools arrange tours for juniors and seniors, or you can schedule one on your own through the school you’re interested in. Researching jobs is just as important as researching colleges. One surefire way to know what you want to do with your future is research. If you have a career in mind, find out about average salaries, and daily job duties associated with that field. If you’re lucky, you can even find someone to shadow or talk to that works in the field you’re interested in. High school is a crucial time for anyone, whether they know what they want to do or not. High school helps prepare you for your next step. Going to a four-year school straight out of high school isn’t for everyone, and there are plenty of other paths if you’re not sure what you want to do yet. Either way, make sure you make the most of what your high school has to offer, do your research, and start early on your future.